A good night cream is one of the top essentials in my beauty regimen. Needless to say, I have been able to try many different types of night creams over the course of my beauty blogging experience. Not all night creams are created equal and when I find one that really works miracles, I want to let the world know about it! 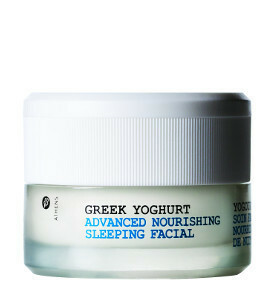 I want to introduce you to my newest favorite miracle product: Korres Greek Yoghurt Advanced Nourishing Sleeping Facial. A centuries-old Greek remedy for skin soothing, moisturizing Greek Yoghurt provides a natural source of proteins, minerals, and vitamins to instantly nourish stressed, dry skin. This ultra hydrating facial-in-a-jar contains a Greek Yoghurt concentrate with 2.5 times the protein content of regular yogurt, and works overnight to provide skin with intense, long-term moisturization and nourishment. You will wake up to noticeable improvements in skin texture and more moisturized, refreshed skin. My Experience: After cleansing at night, I apply this amazing cream all over my face, neck and upper chest area. I first noticed how light it was. The formula is luxurious, but not greasy at all. After using this product for about a week, I noticed that my skin looks at least ten years younger and this is no exaggeration. I do not break out with this cream, I am not oily, and my lines are just invisible! I am completely thrilled!